Nature Babycare believe the use of natural materials contribute to fewer allergic problems and skin irritations and are kinder to your baby as well as the environment. They manufacture award-winning high performance biodegradable nappies based on natural, plant-based materials, kinder to your baby and to the planet. And all Nature Babycare products are totally chlorine free, contain no perfume, dyes or parabens, the wood pulp used is from sustainably managed Scandinavian forests and the baby wipes even come in eco packaging. Go green without giving up performance! Why is Chlorine-Free so important? Your choice of chlorine-free nappies could help reduce cancer rates. The current level of dioxin pollution in the world creates an unacceptable cancer risk for everyone. Buying these nappies helps reduce the amount of dioxin polluting our air, water and soil and helps make the world a safer, healthier place for your family for generations to come. Hundreds of studies have shown a direct link between dioxin exposure and cancer, birth defects, and environmental and reproductive disorders. To properly dispose of the nappy, place the nappy in a Nature Babycare Disposal Bag and place in the waste bin. Do not compost. Human waste contains bacteria that can contaminate water and harm the surrounding environment, including people. Harmful bacteria must be subject to high temperatures for a sustained period of time to kill them off. It can be difficult to attain the necessary temperature in all parts of a small compost bin or pile. With features such as stretchy tabs and leg gatherings, a soft cloth-like feel, and non-bulky absorbent pulp, we've created an award-winning diaper that performs ahead of the rest. Nature Babycare Nappies are made from a 100% GM-free biodegradable natural maize film, which lets baby's skin stay dry and breathe naturally. They are 100-percent chlorine-free, protecting the environment by not producing harmful dioxin pollution. The absorbent pulp contains a chlorine-free biodegradable tree pulp from sustainably harvested Scandinavian forests and the patented center-channel means a less bulky fit while enhancing leak protection. Since we use 60-percent natural materials instead of plastic, our diapers are super soft and cloth-like providing comfort without sacrificing protection. We keep oil-based plastics away from babies delicate skin and use natural, breathable corn-based materials instead. All of this combined minimizes nappy rash and other irritations so that your baby is healthy and happy! Our founding principle was to give mum's a high performance diaper that is better for their baby and better for the environment. We strive to use renewable materials whenever possible in all of our product lines. Nature Babycare Diapers offer the convenience of disposables with the most environmentally friendly attributes. Conventional nappies are often composed of up to 80% oil-based products and can take hundreds of years to decompose, but because ours are over 60-percent biodegradable, they break down in a fraction of that time, meaning there's less need for landfill or polluting incineration. Not only is the diaper itself environmentally friendly, but the packaging is 100% biodegradable and OK Compost certified. Nature Babycare Diapers have received numerous awards including the “Editor’s Choice” Award in ’06-’07 from Junior Magazine in the United Kingdom and, more recently, the ’08-’09 “Best Disposable Diaper” Bronze Award from Mother and Baby Magazine in the UK. I am happy with the look, feel and even cost of the nappies. The service is also very reliable! Very happy with them nappies! No smell, no chemicals! Quiet and dry nights! Thank you for existing! 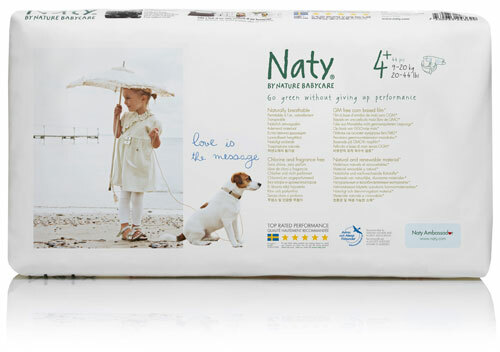 Our baby has been wearing the Naty Nature Babycare from the moment she was born and we couldn't be happier! No chemicals = no problems! I find these nappies great. I only use them at night as I have cloth nappies for the rest of the day. They have good soakage, are comfy, not bulky. Obviously Eco friendly and no chemicals in them which was the selling point for me, biodegradable. i wouldn't use any other disposables. Also very good value, and they have the monthly box too which is handy. All around good product.